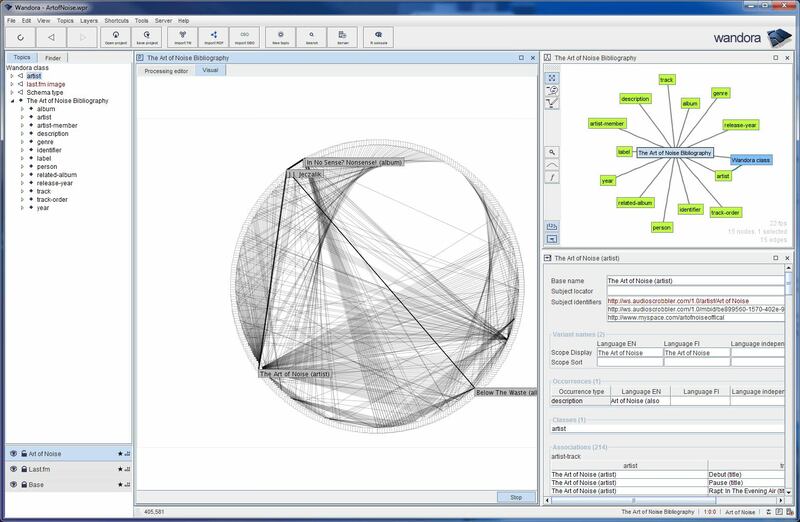 Wandora is a general purpose information extraction, management, and publishing application based on Topic Maps and Java Swing. Wandora has graphical user interface, layered presentation of knowledge, several data storage options, huge collection of data extraction, import and export options, embedded server, and open plug-in architecture. Wandora is a FOSS application with GNU GPL license. Wandora introduces a layered information model where the knowledge base builds upon separate information layers each containing only part of the knowledge. The developer can view only layers that she finds interesting. It is easy to manage separate information layers. Wandora supports not only memory based information layers but also database based layers. If you need more information please contact the developers of Wandora (Grip Studios Interactive), or check out their product website.